The River Damsel: The Guest Bloggeress?? Yes, my hiatus is dwindling down it seems... The River Damsel has been asked to write a few guest posts recently...so here we go again!! Could I become a female "freelance blogger"? Mmmm...I don't think so. 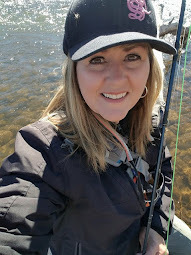 But, I am having a good time writing for a few friends...so please join me over at Fly Fishing Frenzy ! These guys are the cream of the crop. 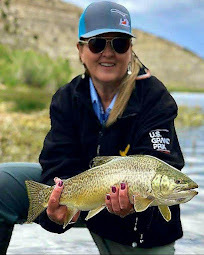 They have a blog site with pictures of awesome fish, tons of great fly fishing stories, videos, reviews, and river reports. I know a few of the "Frenziers" and they are quality guys. (Some are from Utah and some from Idaho). One of them even casted into a strong wind storm for me, so I could bring in a fish before the day was over...that's "top notch" in my book. ("FB" pic below) So, go take a gander at my little post and check out FFF's latest Holiday Give-Away Contest!! 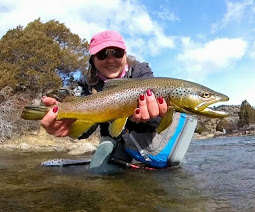 There is a Scott fly rod in the mix...oh yeah! 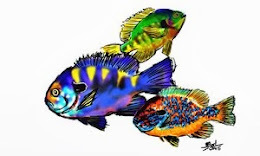 You could always be my co-fisher? Howard - When I learn how to fish and write? Ha! You are doing just fine.